Description: Today is a very special day, it`s Blonde Princess`s birthday and what better place to celebrate than at the spa? 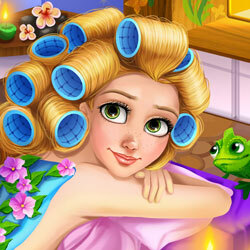 Go into the castle and help the blonde princess relax with facial masks and special spa treatments. Choose the right makeup to highlight her beautiful green eyes or you can change her eye color to create a new look. Complete the makeover by picking an elegant gown and accessories, so the princess can enjoy her birthday.